Also known as Panthera Tigris, Bengal Tiger is one of the most regal wildlife creations one can witness. The Royal Bengal Tiger is actually a sub-species of the tiger family and dwells in the regions of India, Nepal, Bhutan, Bangladesh, Myanmar and parts of Southern Tibet. 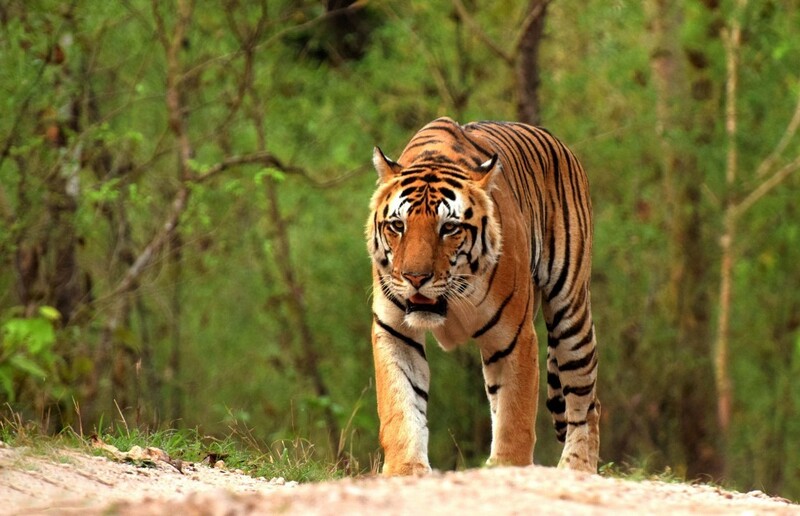 In India, it is seen in large numbers in Pench Tiger Reserve. For its charm, beauty and power, India has also picked Royal Bengal Tiger as its ‘National Animal’. 1. A grown-up male Bengal Tiger can size up to 420 pounds. The absolute size of this big cat can clasp you in awe. A grown-up Bengal Tiger can reach nine feet in length. The female tigress, though, is smaller in correspondence to the male and more often than not weighs around 310 pounds. Tigresses hardly ever grow further than 8 feet in length. 2. They have massive power. The potent structures of a Bengal Tiger facilitate them to haul a prey for nearly a mile, even while the prey might be heavier than his own weight. 3. The white Bengal Tiger is a rare phenomenon. A white Bengal Tiger with black stripes is owing to gene mutation and not because they are albino. 4. The Bengal Tiger has the lengthiest canine amongst various carnivorous animals. A canine in Bengal Tiger can grow upto 4 inches and are longer than that of a lion. These strong creatures also have sheathable claws which help them to climb. Their vision is greater as compared to many animals and they have exceptional hearing ability. 5. Bengal Tigers are unsocial animals. They choose the low lands and are habitually seen in grasslands, marshes and mangroves. These unsocial (solitary) animals typically come together only for the duration of the mating season. Occasionally, they can be speckled living in groups of 3-4 tigers. 6. The Bengal Tigers own big territory. They might seem to be lazy animals, snoozing and resting by day, but as soon as they rise in action, tigers are recognized to travel large distances, protecting and owning a territory that can spread to as much as 200 square miles at times. 7. The Bengal Tigers can climb up on trees. These heavy animals are not suitable to climb the trees, however in pursuit of a kill; they can ascend upon a tree, though they seem clumsy while doing so. 8. They are amazing swimmers. The mangrove ecosystem is an opulent habitat for these tigers and they have reformed by being zealous swimmers. A prey cannot run from their powerful jaws even in the water bodies. 9. Their desired preys are antelope, wild boars, deer and even water buffaloes. But when the need emerges, they can kill crocodiles, monkeys, leopards peacocks, wolves and even baby elephants. Mainly anything that moves about can be their food, when a tiger is starving. 10. Skilled killers, they are swift at finishing off a target. One powerful attack and the target has nowhere to run for its life, for the tigers has such strength that it can break the spinal cord in one jerk or a hold of the throat merely pulls the life out of any animal held there. 11. The Bengal Tiger is an avid meat-eater. This big cat can consume over 30-40 kg of meat in one solo meal and then feel no necessity to search for another 3 weeks. 12. The female tigress gives birth to a litter of 3-5 cubs. Female Bengal Tigers mature at 2 1/2 years of age. The development period lasts for around three months. The Bengal Tiger can survive for almost 25 years in confinement and a little less in the jungle terrains.